Richard the Third is a quotable play indeed. But what does it all mean? This film starts with an arty looking Al Pacino alongside Kevin Spacey, who enters the theatre to see a lone Shakespeare is the audience. Then there is a slew of confused vox pops. With various thespian luminaries, including Kenneth Brannagh et al. This is setting the scene for the search of the title and is surely a deliberate device to show the difficulties of the play, and trying to film it. The themes are somewhat confirmed by some well-known names, referencing stagey acting and dull teaching. ‘Now…’ says Al to camera, Hollywood style shades in place. There are sideways turns to explain the context, English Civil War, the York victory. The nature of the ‘discontent’. Richard’s lament is that he can’t pursue love as an alternative to war due to his deformity. Pacino cuts to several academics, between his speeches, to fill in the gaps. Perhaps impertinently I couldn’t help thinking of Peter Sellers’ satirising of the scene. 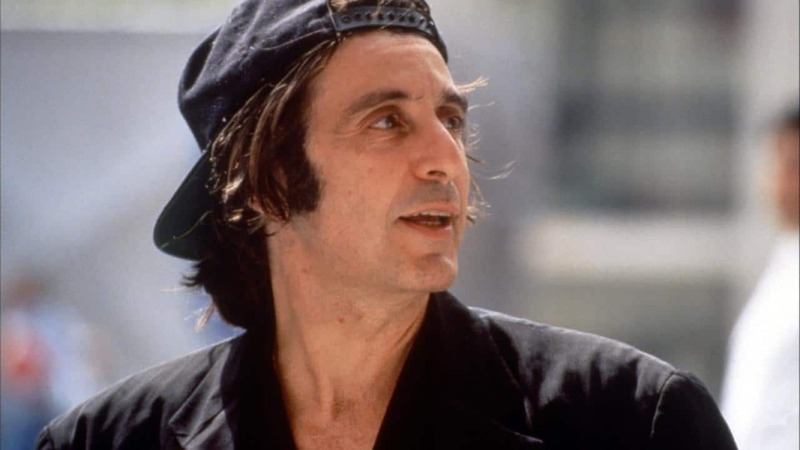 Especially when seeing Pacino’s various haircuts and head wear: pony tails, beards, bandanas, a ,scent of a woman’ cap sat reversed on his head. But I am being pernickety. There is genuine enlightenment, for example a lucid description of iambic pentameter. The conceit of simultaneously performing scenes, commenting on them, showing rehearsals of them, explaining them in discussion and voiceover, and getting a little academic insight works well. 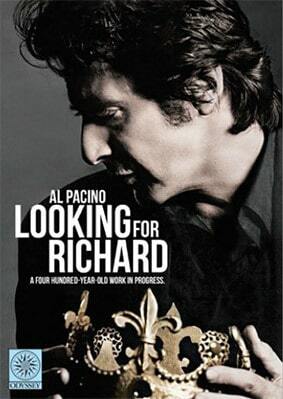 Looking for Richard, indeed, and also finding and explaining him. Pacino does not shy away from the complexity of the plot, and multiplicity of the characters. The issue of ‘speaking loud and being truthful’ is identified as a problem for Shakespearean actors. There is some amusement. Pacino being kicked out of Shakespeare’s birth place by an officious Brit after a fire alarm goes off. 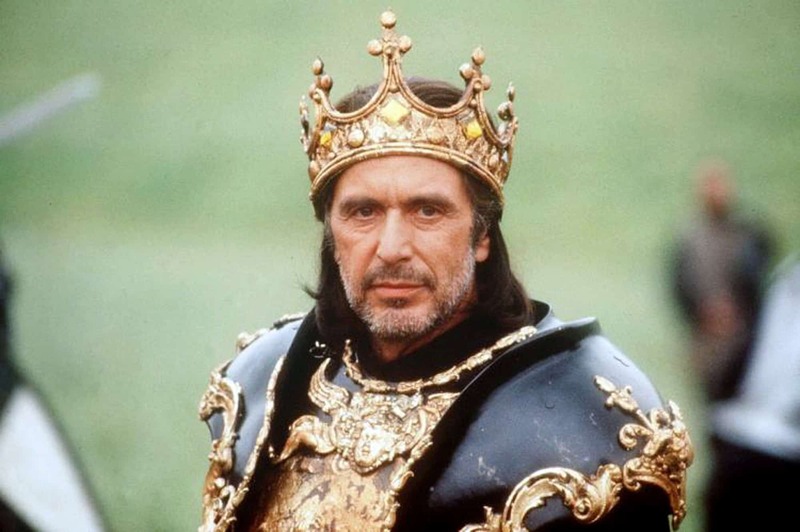 And when Pacino read ‘the anointed’ instead of ‘the annotated’ Shakespeare – and was quickly corrected – was he joking? Or is he a poor reader? … let’s be kind. Some of the devices become a bit obtrusive. In a key scene – of film and play – Richard asks Anne: ‘Shall I live in hope?’ And Lady Anne replies: “All men are hopeless.’ The scene draws you in and makes you forget this is essentially a post-modern documentary, until a sudden cut to Pacino in a previous scene knocks you straight out of the moment. Perhaps that was the idea. It’s a ‘labour of love’ yes, but without the pretension that phrase sometimes implies. It is a fresh and engaging examination of the Bard. Looking For Richard has recently been re-released by Odyssey on DVD in the UK. Gets a yes from me.